"How the Indian Averted Famine"
From the Center for Columbia River History. Delegation of Lemhi and Fort Hall Northern Shoshone and Bannocks who went to Washington in May of 1880. Image courtesy Lemhi County Historical Society. Read John Rees' description of the vote to leave the Reservation. Women in camp outside of Salmon, Id. Lemhi participating in Salmon parade. 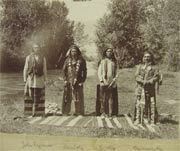 The Shoshones did not sign a treaty in 1851 at the great gathering near Fort Laramie, Wyoming. They were invited to witness the treaty negotiations and signings with the Plains tribes, and to agree to intertribal peace. Portion of Pierre John De Smet's 1851 Indian Lands, for D.D. Mitchell. Courtesy of the Mike and Maureen Mansfield Library, The University of Montana. 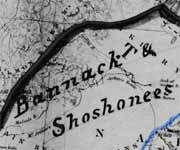 Mapmaking at that historic gathering defined the eastern and northern boundaries of Shoshone territory, as shown on this 1851 map prepared for D. D. Mitchell, Superintendent of Indian Affairs. arrival, at the Fort Laramie council grounds. Located at the confluence of the Judith and Missouri Rivers, this great gathering established the first treaty relations with the Blackfeet Confederacy. Western Tribes were represented and helped negotiate the Common Hunting Grounds in the Three Forks Basin. “The Snake Indians had planned to be parties to this treaty and had come to Fort Benton several weeks previously, but owing to the delay in the arrival of the treaty goods, had found it necessary to go far to hunt and to provide grazing for their horses. When the great treaty council was about to begin, it was found that the Snake Indians had gone too far southward to be recalled in time for the inter-tribal negotiations. A brief mention is made of the Snakes in the official treaty as one of the tribes with whom the Blackfeet were to be at peace" (Partoll 1936-37:201). "It is agreed that whenever the Bannacks desire a reservation to be set apart for their use, or whenever the President of the United States shall deem it advisable for them to be put upon a reservation,he shall cause a suitable one to be selected for them in their present country, which shall embrace reasonable portions of the "PortNeuf" and "Kansas Prairie" countries, and that, when this reservation is declared, the United States will secure to the Bannacks the same rights and privileges therein..." (B.A.E. Report: 1896-97). "Tendoy, the successor to Snag, was unable to attend the treaty negotiations, but he sent in his place one of his sub-chiefs, Taytoba, whose name appears among the signatories to the treaty. Throughout the deliberations, however, General Christopher C. Augur failed to recognize that Taytoba was a Lemhi headman, not a Bannock. When presents stemming from the treaty signing were not forthcoming to the Lemhi as they were to the Shoshones and Bannocks, the Lemhis concluded erroneously that they were not signatory to the Fort Bridger Treaty--despite the fact that Taytoba had signed the treaty" (Svingen). "Failing to grasp the meaning of what had taken place, the federal government agreed to enter into what it thought to be separate negotiations with the Lemhi Tribe. 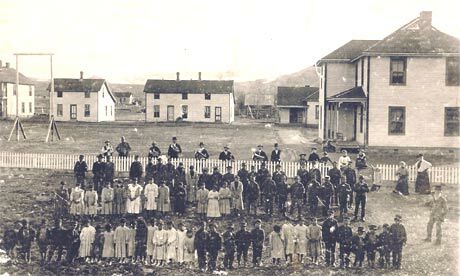 Meeting with only two members of the Indian Peace Commission, five to six hundred Lemhis met at Virginia City, in Montana Territory. The Virginia City Treaty was signed on September 24, 1868, and it provided the "mixed tribe of Shoshones, Bannacks, and Sheepeaters" with two townships of land on the Salmon River, twelve miles north of Fort Lemhi. 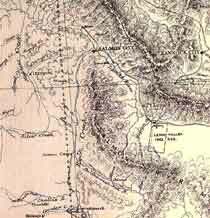 The treaty acknowledged the claim of the Lemhis to a vast holding, extending westward from the Yellowstone River to the Bitterroots Mountains. 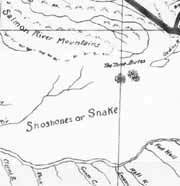 Lands noted in the Virginia City Treaty, moreover, were preferable to the Snake Plains near Fort Hall because they supported the Lemhi's traditional hunting and fishing activities. Unlike the Treaty of Fort Bridger which the United States Senate ratified on February 26, 1869, the Senate failed to ratify the Virginia City Treaty, causing its stipulations to become meaningless" (Svingen). showing Lemhi Reservation boundaries (section 575) (Powell: 1899). Portion of 1881 Department of the Columbia map by Thomas Symons. Courtesy University of Oregon Library Map Collection. "President sets apart tract on Lemhi river in lieu of reserve provided for by unratified treaty of Sept. 24, 1868. Boundaries as follows: Commencing at a point on the Lemhi river that is due W. of a point 1 mile due S. of Fort Lemhi; thence due E. about 3 miles to the crest of the mountain; thence with said mountain in a southerly direction about 12 miles to a point due E. of Yeanun bridge on Lemhi river; thence W. across said bridge and Lemhi river to the crest of the mountain in a northerly direction to a point due W. of the place of beginning; thence due E. to the place of beginning. "In the foregoing unratified treaty the Indians agreed to cede all claim to land outside of the reserve therein described as commencing at Point of Rocks on the N. fork of Salmon river 12 miles above Fort Lemhi, and containing two townships of land. This reserve takes its place, and may therefore be considered as an original reserve" (B.A.E. Report: 1896-97). "Opposition to the Lemhis remaining in their homeland emerged almost before the ink had dried on the executive order--coming from policy makers in Washington, DC and local settlers. Three Shoshone reservations seemed excessive and local residents resented sharing what they perceived to be limited space in the Salmon River region. Meanwhile, Tendoy and his subchiefs continued to reject emphatically the suggestions that they relocate to Fort Hall, so the Indian Office considered moving them to the Crow Indian Reservation in Montana Territory. This alternative failed to win support as well" (Svingen). The Lemhi - Shoshone bands learned of the coming executive order to close the reservation and force their removal to Fort Hall in 1879. "Finally, the government decided to take a Lemhi delegation to Washington, DC, where it hoped to secure their agreement to remove to the Fort Hall Indian Reservation. 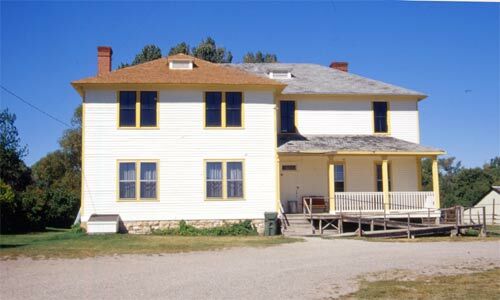 After experiencing a tour that was designed to impress the Lemhi with the grandeur and majesty of the United States, Indian Office officials persuaded Tendoy, his son Jack, and two other Lemhi leaders to sign an agreement to move from the Lemhi Valley Indian Reservation to Fort Hall. Before the agreement was binding, however, a majority of the male population of the Lemhi Reservation was required to give its approval. While approval was never forthcoming, it was used as leverage by the federal government to brow beat the Lemhis into moving to a location that had been historically and overwhelmingly rejected" (Svingen). Cede to the U.S. a certain tract. This agreement provided for the cession of the Lemhi reservation to the U.S., and the removal of the Indians to the Fort Hall reservation. It also provided for the cessions of a portion of the Fort Hall reservation to the U.S. The Indians on Lemhi reservation refused to remove to Fort Hall reservation, and this agreement was never ratified by Congress" (B.A.E. Report: 1896-97). Congress had not ratified the 1880 agreement at the time the Bureau of American Ethnology wrote this summary, but did approve the agreement on February 23, 1889. Confirms agreement to cede to U.S. for the use of the Lemhi Indians the following lands: Beginning where the N. line of T.9 S. intersects with the eastern line of their reservation; thence W. with the extension of said line to the Port Neuf river; thence down and with Port Neuf river to where said township line crosses the same; thence W. with said line to Marsh creek; thence up Marsh creek to where the N. line of T. 10 S. intersects with the same; thence W. with said line to the western boundary of said reservation; thence S. and with the boundaries of said reservation to the beginning, including also such quantity of the N. side of Port Neuf river as H. O. Harkness may be entitled to under existing law, the same to be conformed to the public surveys, so as to include the improvements of said Harkness. As the Lemhi Indians refused to leave their reservation, this act was inoperative and never carried into effect" (B.A.E. Report: 1896-97). "Lemhi people who remained behind, choosing to live in Salmon, Idaho, lived at three different locations. Some lived on the "bar," while others lived at the encampment and in particular Salmon neighborhoods" (Svingen). "Tendoy never did leave the Lemhi Reservation. He died on May 9, 1907. That same month, however, more than 500 Lemhis departed their reservation bound for Fort Hall. They rejected the idea of removing to Fort Hall by rail, explaining that the government usually used trains to move prisoners and they objected to being classified in that fashion. Instead, they rode horses and wagons on the 200 mile overland journey. "They packed their meager belongs on horses, strapped the ends of their wick-I-up poles to the sides of their horses and they dragged them along. They were very sad and passed thru the valley, crying. The ranchers along the way could hear their crying for some distance before they passed their homes. The approximately five hundred Lemhis who removed to the Fort Hall Indian Reservation faced a difficult adjustment to their new surroundings. 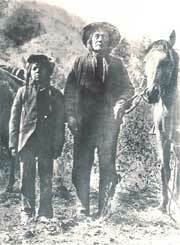 As minorities on a reservation where Great Basin Shoshone-Bannocks outnumbered them, they were forced to enroll at Fort Hall, they received second-rate allotments as the reservation was allotted, and they quarreled with a government that was slow to respond to their request for annuities promised from the 1889 agreement. It is small wonder that they established the tradition of returning annually to the Lemhi Valley to hunt, fish, and visit with a number of Lemhis who remained behind in Salmon. They also tended the graves of relatives buried in their homeland" (Svingen). "During the 1960s, the ICC and the federal government determined that the Lemhi Claim to aboriginal lands would have to be submitted as part of the larger Shoshone-Bannock Claim. The Lemhis were prohibited from filing their own independent claim. When their claim, Docket #326-1, came before the ICC, the Lemhi claim to their land 200 miles north of Fort Hall totaled $4.5 million. Based on pressure from the federal government, the ICC, the Sho-Bans, and the Sho-Bans attorneys, the $4.5 million was assigned to the Shoshone Bannock general fund. Rather than dividing the 1971 Lemhi settlement among the approximately 500 Lemhis living at Fort Hall, it was, essentially, divided among as many as 3000 people living at Fort Hall--the overwhelming majority of whom had no direct or indirect tie to Lemhi lands" (Svingen). Please visit the official Lemhi Shoshone website for a view of the original Lemhi Shoshone reservation, designated by Executive Order in 1875. Also, visit this page for more recent efforts for Recognition from the U. S. government. Research may lead to formal tribal recognition; article by Ted McDonough can be viewed on the Lemhi Shoshone website. Background: Chief Tendoy, courtesy Lemhi County Historical Society.